If you have your eye on the 2019 Heartland Cyclone 4007 then come and see us at Lakeshore RV Center in Muskegon, Michigan for a price you won't believe! We'll save you thousands on this Toy Hauler because we're #1 in RV sales and service, and we sell every brand we carry at wholesale prices in Michigan and beyond! We're conveniently located at 4500 E Apple Ave Muskegon Michigan 49442! 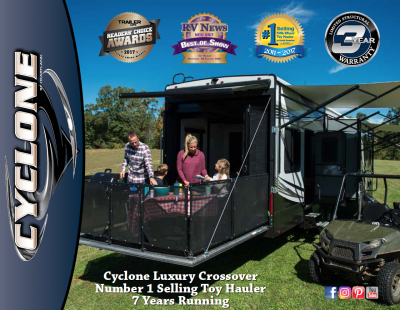 And with our fast, reliable delivery worldwide, you can call us at 231-788-2040 and have this great 5th Wheel Toy Hauler at your door in no time! This rugged Toy Hauler is built for years of fun on the road! It's 44' 0" long, 8' 5" wide, and has a hitch weight of 3665 lbs! The 19' 0" awning opens easily to provide shade and protection for outdoor relaxing - rain or shine! 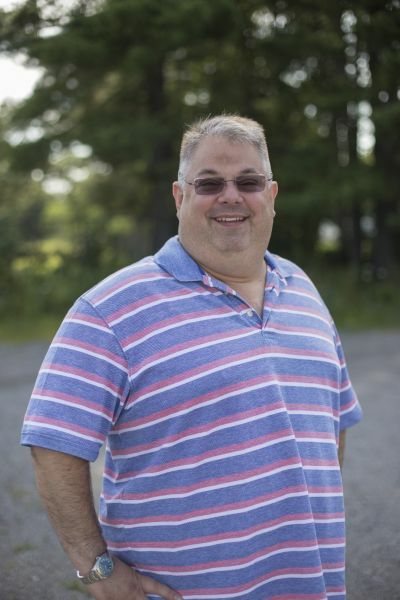 With its GVWR of 20000 lbs, this RV will give you years of camping fun! 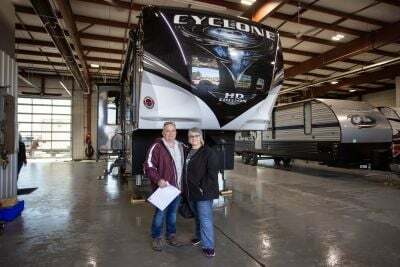 RV living comfort abounds in this 2019 Cyclone 4007 thanks to its roomy 44' 0" length and 8' 5" width. Ample headroom too, at 13' 3" high! With 2 slides, your family will have lots of room to stretch out. And the 35000 BTU furnace will keep them cozy and warm on the coldest nights, while the 15000 BTU a/c will keep them cool and fresh on the hottest days! No more trudging to the cold, damp, and often messy public bathrooms in the campground when you camp in this Toy Hauler, thanks to its roomy, fully-appointed bathroom! The modern shower, handsome sink vanity, and sanitary, sleek Porcelain Foot Flush commode provide you with comfort, convenience, and privacy! Love your outdoor toys? Bring ‘em all in the Heartland Cyclone 4007, with its 13' 0" long garage! ATVs, motorcycles? The 3332 lbs. of cargo capacity can take them with ease! Whip up your favorite meals out in the fresh air! The outdoor kitchen makes summer cookouts and tailgating fun and easy! Is your family too big for just one bathroom? Then this large RV is right for you, with its additional half bathroom! Inside, there is an extra sink and Porcelain Foot Flush toilet! On cold, rainy day or night, you can fire up the fireplace for some much-needed warmth and beauty inside this RV! Of the 3 beds in this 5th Wheel Toy Hauler, the loft bed has an extra comfy mattress! Hidden up above, the loft offers extra privacy as well as comfort.